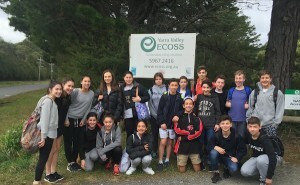 Welcome to the ECOSS Schools Program. We are very excited to be able to offer schools such an innovative program at a very low cost. 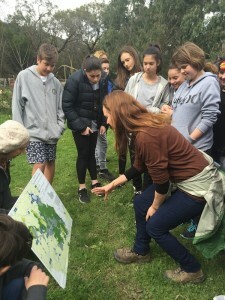 Included in our schools program are subjects that align with many learning outcomes. 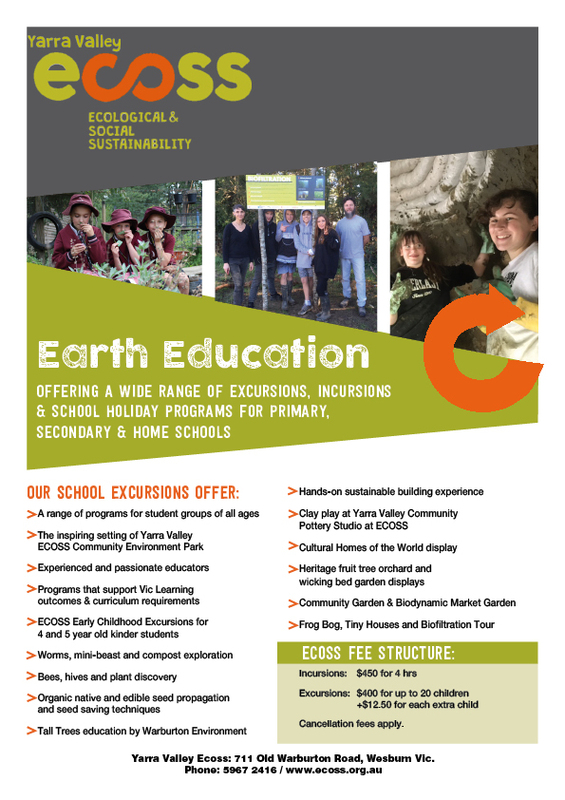 Please email Chelsea on info@ecoss.org.au for enquiries. Compost and Worm Spaghetti– 30 minute activity. We have worm spaghetti to share. What magic do worms perform in your garden? 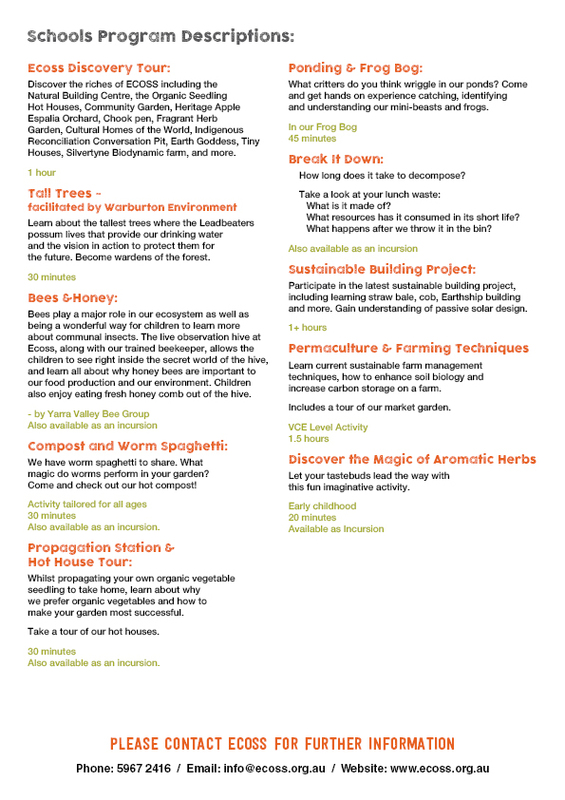 Come and check out our hot compost! Activity tailored for all ages. Also available as an incursion. Learn about the tallest trees where the Leadbeaters possum lives that provide our drinking water and the vision in action to protect them for the future. Become wardens of the forest. Whilst propagating your own organic vegetable seedling to take home, learn about why we prefer organic vegetables and how to make your garden most successful. Take a tour of the hothouses. 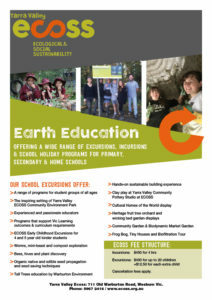 Discover the riches of ECOSS including the Natural Building Centre, the Organic Seedling Hot Houses, Community Garden, Heritage Apple Espalia Orchard, Chook pen, Fragrant Herb Garden, Cultural Homes of the World, Indigenous Reconciliation Conversation Fire Pit, Earth Goddes, Tiny Houses, Silvertyne Biodynamic farm and more. Bees play a major role in our ecosystem as well as being a wonderful way for children to learn more about communal insects. The live observation hive at ECOSS, alsong with our trained beekeeper, allows the children to see right inside the secret world of the hive, and learn all about why honey bees are important to our food production and our environment. Children also enjoy eating fresh honey comb out of the hive. by Yarra Valley Bee Group, Also available as an incursion. What critters do you think wriggle in our ponds? Come and get hands on experience catching, identifying and understanding our mini-beasts and frogs. 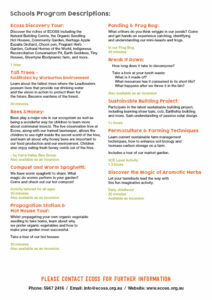 Get hands on and work on our latest Sustainable Building Project. Current projects include our Earthship and Koori Cubby. This could include a number of Sustainable Building Techniques including earth building, glass bottle walls, Cob, carpentry, straw bale and more. Gain an understanding of passive solar design. Guided by our experienced ECOSS Earth Education staff. Join in with our Co-locators Relab in an upcycling activity. This includes green woodworking, craft and upcycling activity that is individually designed to the age of your students, with a ‘take home’ component. Keeping traditional hand skills alive in the Community Pottery Studio Yarra Valley. Storytelling and clay play facilitated by Dakini or Lucy in the Community Pottery Studio at ECOSS. Separate fee structure applies depending on firing/ glazing requests. Let your tastebuds lead the way with this fun imaginative activity. Take a look at your lunch waste. What resources has it consumed in it’s short life? What happens after we throw it in the bin? Also available as an incursion. In this practical lesson we look into ‘what is shelter’, what are the essentials in building design, passive solar design. We measure temperatures of model houses when placed in different orientations to the sun, the function of eves, thermal mass, and insulation. This subject is very progressive and will definitely leave you considering your future designs for your choice in living environments. Harvesting Natural Energies. 3.5hours Year 9-12 students. Students gain understanding of solar, hydro, and wind power. Look into the mechanisms of harnessing power from these elements, how much power can be harnessed? How does it work? Students gain electronics knowledge and get to make small conductors using electronics tools.